There are times when we've just finished composing a piece where our pen is idle for a few days and it's unclear to us what we should attempt to write next. This can put us in a bit of a quandary as we attempt to find an answer to that question. The answer, actually, is quite simple: we can start anywhere. All starting places are equally valid. We can continue in the same genre until our heart's content, or we can branch out in another direction, whatever suits our fancy; the main idea is to remain comfortable while we're creating it. There are exceptions, but, in general, it's counterproductive to first settle upon a form and then struggle to come up with a theme or subject to go with it; this has everything backwards. The theme, which is the "soul' of the music, will pretty much suggest to us what kind of form the composer needs to create to give it a corporeal body best suited to it. It's much more difficult, not to mention frustrating, when we we try to work in reverse, when we tell ourselves we're going to write a certain type of piece, then try to invent a theme for it. When we unearth a theme that looks like it will make a good fugue subject, for example, we can work that theme in rhythmic transformation (same notes in succession, different note values) to come up with another theme. We can then try rhythmically transforming another fugue's subject or countersubjects and see what we can come up with. It's unlikely that any of this will fail to provide some kind of thematic material, but if it doesn't, and we're still stalled as to what to invent, we can rhythmically transform a theme or countersubject taken from anywhere to set our imagination in motion; nothing is off limits in the universe of composing as long as we maintain our originality. If you like the fugue(s) that you've already written, and you've adopted the method described in these posts for creating this type of piece the easy way, then why not write another one. This narrative will explain how the D Major Fugue from Op. 18 (photo) was written, taking the subject through all 5 nearly related keys and making use of certain contrapuntal devices. 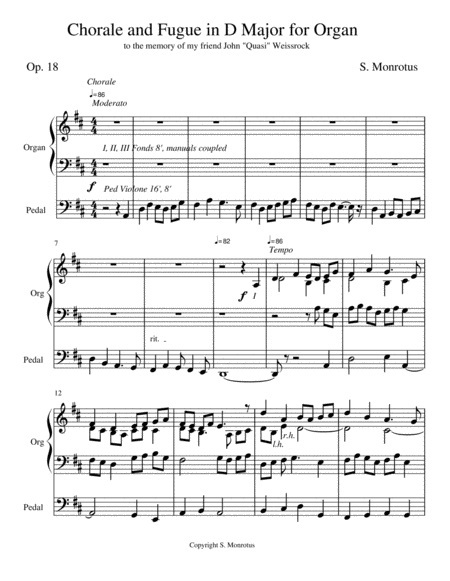 This busy work was put together using only a notebook PC, Noteflight online music writing software, and the method of fugue writing described in these posts [See blog, Getting Started WIth Writing, Part VI]. By way of review, once we have a blank score and have settled upon a time signature and key signature, we place our fugue on one line and invent a countersubject to go with it; the 2 lines together should create perpetual 8th note or 16th note motion. After this, we should work out on a separate sheet of paper how many entries the Fugue will have, in what keys, and the voice leading in each, giving each voice at least one opportunity to carry the subject once the exposition (referred to in these posts as the "1st entry") concludes. Let's say we'll be writing in 4 voices and there will be 6 entries altogether, we're going to take the subject through all 5 nearly related keys, and we're going to have a (5th) redundant entry in the exposition. Obviously, in a 4 voice fugue with 5 additional entries following the exposition, the subject will have to appear in the same voice in more than one entry, that's just a fact of life, but by working it all out in advance on a separate sheet of paper every voice might be charted to carry the subject at least once, and excessive duplication in the voice leading may be avoided. It will help to download and print a copy of the D Major Choral & Fugue Op. 18 and follow it as this narrative proceeds [See menu bar, Free Stuff] ... the Choral is discussed separately in Getting Started With Writing, Part XV. We'll start, let's say, with the subject in the soprano line in the home key starting on the 1st scale degree with a real answer supplied in the tenor in the dominant key and a (1st) countersubject continuing in the soprano. This is a very common and useful way to begin a fugue; and here, with the opening statement of the subject being on the 1st scale degree, the answer follows on the 5th degree, as expected. A 4 bar modulating episode for 2 voices then brings about a smooth return to the home key for the 3rd entry. This time the subject enters in the alto; a 3rd voice meanwhile appears in the soprano as the (1st) countersubject is repeated in the tenor. completing a 3 voice texture. Since this free voice is repeated in each subsequent entry it becomes a 2nd countersubject. The subject then makes a 4th entry in the dominant key in the bass, the alto carries the 1st countersubject, the tenor carries the 2nd countersubject, and a free voice assigned to the soprano completes a 4 part texture. Ordinarily this would complete the exposition in all its essentials, but here, we find something unexpected ... a (5th) redundant entry with the subject and both countersubjects very unusually inverted! [See blog, Getting Started With Writing, Part XIII]. This additional entry allows the alto to carry the 2nd countersubject and the bass to carry the 1st countersubject for the purpose of exhibiting the double counterpoint between these 2 lines in the exposition; since the subject is reiterated here in the original opening voice (the soprano) it becomes, in effect, super-added, hence the term "redundant." What's significant about this redundant entry is that 1) it proceeds immediately on the heels of the 4th entry, 2) it remains in the same dominant (A Major) tonality as the 4th entry, and 3) the subject and both countersubjects are inverted! Inversions like this have been used elsewhere in fugues and lend a certain energy and freshness to the harmony [See blog, Getting Started With Writing, Part VI]. This allows the bass the opportunity to carry the 1st countersubject in the exposition and the alto to carry the 2nd countersubject, thus giving these 2 voices fuller participation in the exposition by displaying the double counterpoint between them; hence, this was the purpose behind it. Next there comes the first of several 4 bar episodes between entries; each of these episodes functions as a modulating link to connect the key being left with the key being approached; as such, they can be constructed upon sequences obtained from rhythmic snippets of the subject or countersubjects; for the sake of variety the left hand and right hand parts of these sequences may switch with every bar; this helps to prevent monotony and makes for smooth connections between entries. The 3rd entry is in the relative key (b minor) with the subject appearing in the soprano, the 1st countersubject in the bass, the 2nd countersubject in the tenor, and the free voice again in the alto. Following another episode of 4 bars the 4th entry is in the subdominant relative key (e minor) where the subject appears again in the bass, the 1st countersubject in the soprano, the 2nd countersubject in the alto, and the free voice switches to the tenor line. Another 4 bar episode precedes the 5th entry in the subdominant key (G Major) during which there is a crescendo to another level of loudness; in this entry the subject enters in the soprano, the 1st countersubject in the low tenor, the 2nd countersubject in the bass, and the free voice returns to the alto; at this point in the Fugue every voice save for the alto has had opportunity to carry the subject. One peculiarity in this music is that after the exposition the subject never returns to the alto line; this is because the alto is the best and most flexible of all 4 voices for the carrying of a free voice to complete a 4 part chordal harmony; when the soprano is low and the tenor is high at the same moment it can be a tight squeeze on the page, and the alto therefore is where the free voice is best placed. Following another modulating episode of 4 bars the 6th entry proceeds in the dominant relative key (f# minor) with the subject entering in the tenor, the 1st countersubject in the bass, the 2nd countersubject in the soprano, and the free voice, this time, switches to the tenor. Here the high Bb which would appear in the 2nd subject is tweaked (lowering this note to G#) in order not to exceed the voice range of the soprano. After a final episode of 4 bars during which the tempo slows down there is a return to the home key (D Major) where the final entry has the subject reentering in the bass with full organ; here the 1st countersubject is carried in the soprano, the 2nd countersubject in the tenor, and the alto has a free voice to complete a 4 voice harmony. A coda of 5 bars follows and concludes the work during which the head of the Fugue's subject is segmented in the pedal; the Fugue ends in 8 voices in spread harmony for both hands; the final chord is reiterated with an added 2nd, all under an inverted pedal point. Guided by a separate sheet of paper we can proceed with dispatch in writing a fugue like this; there's nothing that says we have to compose it from 1st note to last, which has to be the hard, long way around. Once we complete all of the 4 voice entries on the screen in separate "chunks" we can then proceed to connect these chunks like a string of beads with episodic material and watch our Fugue grow right before our eyes -- it seems to assemble itself, like magic [See blog, Ten Steps]. It may come as a surprise that this entire Fugue only took 3 days to compose this way using a notebook PC and online music writing software (Noteflight). Someone else can do the same or better.